BuzzFeed is doubling down on its report that Michael Cohen told the special counsel President Donald Trump instructed him to lie to Congress about his dealings in Russia. Special counsel Robert Mueller issued a rare statement rebutting BuzzFeed’s story, but BuzzFeed reporter Anthony Cormier said he has “further confirmation” his report is accurate. But Cormier also acknowledged he is still in the dark about specifically what Cohen told the special counsel, and what precisely Trump allegedly told Cohen. BuzzFeed editor Ben Smith and reporter Anthony Cormier doubled down Sunday on their bombshell report that President Donald Trump directed Michael Cohen to lie to Congress about his efforts to build a Trump Tower in Russia. “I have further confirmation that this is right. We are being told to stand our ground. Our reporting is going to be borne out to be accurate, and we’re 100 percent behind it,” Cormier told CNN’s Brian Stelter during an interview about their report, which has been directly disputed by the special counsel’s office. Cormier dodged Stelter’s questions about documents that his colleague, Jason Leopold, claims to have seen as part of the reporting process. Cormier also acknowledged he is not certain what Cohen specifically told the special counsel or what Trump allegedly told Cohen. Cormier and Leopold reported Thursday night that Cohen told the special counsel’s office Trump directed him to lie to Congress in 2017 about his efforts to build a Trump Tower in Moscow during the 2016 presidential campaign. 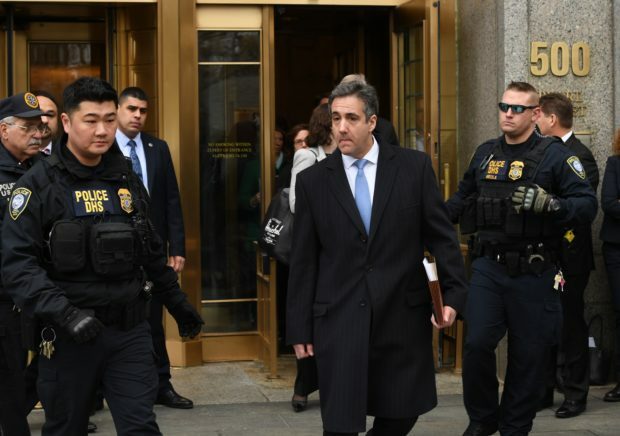 Citing two unnamed law enforcement officials, the reporters claimed documents and other witness testimony would corroborate Cohen’s version of events. Democrats jumped on the story, calling for investigations into whether Trump suborned perjury or obstructed justice. Nearly 24 hours after the story appeared, a spokesman for special counsel Robert Mueller delivered a devastating rebuttal to the report. “BuzzFeed’s description of specific statements to the Special Counsel’s Office, and characterization of documents and testimony obtained by this office, regarding Michael Cohen’s Congressional testimony are not accurate,” spokesman Peter Carr said in a statement. The New York Times and Washington Post since reported the statement was intended to be a full-throated rebuttal to the claim that Cohen told Mueller’s office he was told to lie by Trump. But Smith and Cormier remained confident in the face of the Mueller pushback. “What if the sources are just wrong?” Stelter asked Cormier, who won a Pulitzer Prize in 2016. “They’re not. They’re not. I’m confident,” Cormier replied. But while BuzzFeed is refusing to back off of its story, numerous questions remain about what sources and documents were used for the report. In an interview Friday morning, prior to the Mueller statement, BuzzFeed’s Leopold told MSNBC he had seen documents referred to in the report. Cormier said in a separate interview with CNN he had not seen documents. Cormier avoided Stelter’s question about that apparent discrepancy. “Can’t really get into, like, the details there,” Cormier said. “Really, at this point, because of the calls for a leak investigation and the sort of sensitivity around that matter, we really can’t go any further at all in order to not jeopardize our sources,” he added, noting Trump’s lawyer Rudy Giuliani had called for an investigation into who leaked information for the BuzzFeed report. BuzzFeed’s spokesman, Matt Mittenthal, issued a similar statement Saturday, even before Giuliani called for a leak probe. “In the interest of protecting … sources, we aren’t going to speak further on the details of who saw what and when, beyond what’s in the reporting,” Mittenthal told The Daily Caller News Foundation. Cormier also suggested BuzzFeed is not quite certain exactly what Cohen might have told the special counsel and what he and Trump may have discussed regarding the former Trump lawyer’s congressional testimony. “We’re trying to figure out how to parse the statement from the Mueller team, and what’s happening now only behind the scenes at DOJ and the special counsel, but we’re trying to get deeper inside the room where this happened,” Cormier said. “We’re trying to get the exact language that was used in this conversation, and we’ll get there one day,” he added. In another exchange, Stelter pressed Smith over Leopold’s efforts to request comment from the special counsel prior to running the story. Leopold contacted Carr hours before the story ran to say BuzzFeed was planning to report that Cohen claimed Trump instructed him to lie to Congress. The request did not say Cohen made the claim during interactions with the special counsel. Carr, who rarely offers comment to reporters, declined comment. But according to The Washington Post, Carr has since claimed if he had known precisely what BuzzFeed was planning to report, he would have pushed back harder on the allegation.